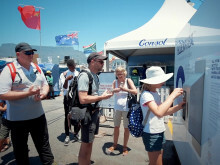 Cape Town, April 15, 2019 – An innovative new mobile water station has been developed by Bluewater, a world leader in water purification technology and solutions, to provide safe drinking water for remote workforces in the African mining sector. The hydration stations improve water quality and worker satisfaction, cutting costs and spurring improved environmental performance by slashing the need for costly single-use plastic bottles. “Unique hydration stations from Bluewater offer tangible benefits to mining operators where providing drinking water can be logistically challenging and costly,” said James Steere, Bluewater Africa Operations Director. 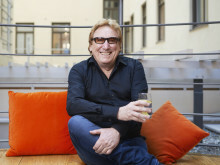 Andrew Cooper , MD of FreshCamp Services, has 20 years of experience in logistics, site mobilisation and day-to-day contractor village management, and says that provision of clean drinking water can account for as much as ten percent of the catering costs for mining operations. “Basically, the more remote you are, the more complicated delivering clean water becomes. While a mine-owned RO plant is fairly standard, there are places where even treated water may be unsuitable for drinking. In some cases, water is transported in tanked vehicles from site to site, transferred at each site to an overhead tank, then RO treated again before being fed into the camp water system, all highly inefficient,” says Cooper. A world leader in water purification technology and solutions, Bluewater has been piloting their revolutionary mobile water trailer and an add-on micro water purification plant since late-2018. A single Bluewater Trailer can purify and dispense up to 2000 litres of drinking water on site per day from most water sources. The trailer’s compact design enables multiple water points to be established around an operating site and the mobility allows for on or off-site centralised water purification. Where multiple trailers are required, Bluewater has developed a small treatment plant at which trailers can refill before delivery to teams, effectively creating a highly efficient hub-and-spoke treatment and delivery process. The treatment plant uses a patented SuperiorOsmosis™ purification technology and requires a 5m x 5m area to set up and operate. It can even generate safe drinking water from normally tough-to-purify brackish or borehole water. The three metre-long Bluewater Trailer also uses Bluewater technology to further purify the water and offers chilled and sparkling water from multiple dispenser points mounted into the sides of each trailer. The South African film industry has already embraced the service with overwhelmingly positive results. 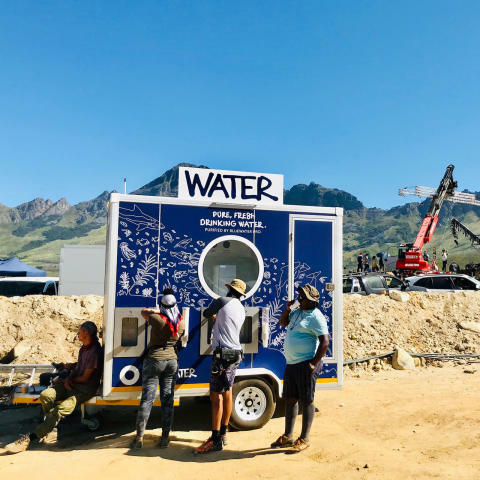 On the set of a new Sir Ridley Scott television series Raised by Wolves, over 400 crew working at a remote location in the Western Cape have filled reusable water bottles with chilled and sparkling drinking water since November 2018. This has yielded a saving of approximately 73,963 single-use plastic water bottles. With the recent launch of the World Gold Council’s Exposure Draft for Responsible Gold Mining Principles, the need for quantifiable commitment to more transparency in mining has been highlighted and the Mobile Trailer offers reporting capabilities well suited to this purpose. “A key element of our system is the integrated smart technology built into each trailer that gives us real-time, accurate monitoring and reporting on its performance, which creates improved operational efficiencies that allow us to pass on reduced costs to our clients, all while providing an accurate measure of water consumption and plastic waste reduction,” said Steere. The Bluewater Trailers service is currently available in Gauteng and the Western Cape.